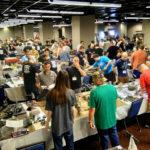 There’s rightfully a lot of buzz around 40k’s 8th edition even among people not currently engaged with the game, e.g., among the X-Wing crowd here, and I’m hoping we can recruit fresh new players into our local community. So this morning I sat down with the leaked rules to be prepared to run demo games at a release party tomorrow. Literally almost instantly one of my biggest fears about this edition seemed confirmed: The rules are at times sloppy and inadequately specified, a casualty of mistaking shorter text for streamlined gameplay. By absolutely no means is that to say they’re unplayable, broken, or won’t be fun. I’m looking forward to the edition and think it could be great. But we shouldn’t go into this new era of Warhammer 40,000 with unrealistic expectations that the game is suddenly free from significant open rules questions, let alone balance issues. 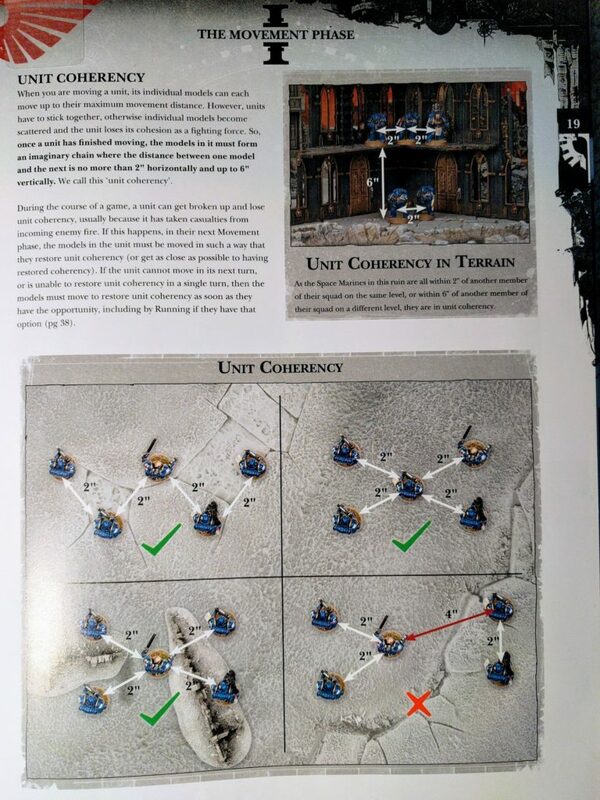 The example that leapt out at me immediately is unit coherency, one of the core concepts in 40k and one distinguishing it from many other types of miniatures games wherein models act individually or in strict formations. … once a unit has finished moving, the models in it must form an imaginary chain where the distance between one model and the next is no more than 2″ horizontally and 6″ vertically. We call this ‘unit coherency’. Main rules on coherency for 7th edition. This is a fundamental mechanic of the game that’s simple in essence but surprisingly somewhat tricky to capture fully. As such its main rule gets an entire page in the 7th edition rulebook (pg 19). In addition, there is an earlier note explaining the intent that “Units fight in loose groups with gaps between each model…” (pg 9), and special provisions for vehicle squadrons (pg 79) and independent characters (pg 166). This 7th edition definition is already not ideal. What is an “imaginary chain”? That’s not a formal game term with any precise meaning. The rule relies on the reader’s understanding of an intuitive concept. That’s problematic on its own, but then the two “X” formations given as permitted formations exacerbate it by not actually fitting a typical natural idea of a chain as a single linear sequence of links, e.g., a necklace or lock. The definition relies on an intuitive understanding that isn’t applied in a totally clear and straightforward fashion. A unit is in coherency if for every pair of models in the unit a sequence can be listed from one to the other of models in the unit each within 2″ horizontally and 6″ vertically of its predecessor. A unit is in coherency if for every pair of models in the unit they are either within 2″ horizontally and 6″ vertically of each other or a sequence can be listed from one to the other of other models in the unit each within 2″ horizontally and 6″ vertically of its predecessor. The graph over models in the unit with an edge between every pair of models within 2″ horizontally and 6″ vertically of each other must be connected. 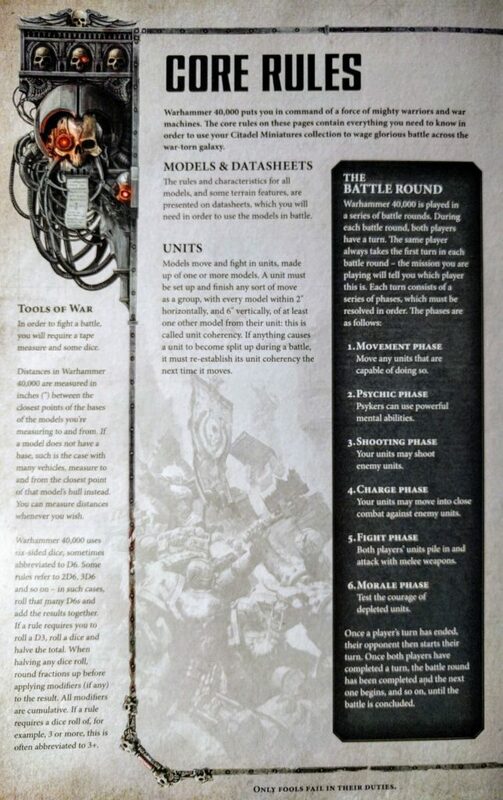 Regardless of these more clear specifications, the text and figures in the 7th edition rules get the concept across solidly and concisely: Models in a unit are supposed to move and fight in close proximity. If you came to the game knowing nothing about it, you would quickly understand that models in a unit cannot be spread all over the place. A unit must be set up and finish any sort of move as a group with every model within 2″ horizontally and 6″ vertically of at least one other model from their unit: this is called unit coherency. Coherency rules in 8th edition. 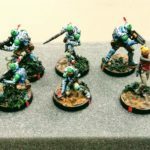 A unit of 4 models in coherency under 8th edition rules. Assume they deployed that way or properly moved “as a group,” all at one time rather than switching between units. The pictured unit is then inarguably in coherency under 8th edition rules. To quote: “Every model [is] within 2″ horizontally and 6″ vertically of at least one other model from their unit.” All of the models meet all of the given criteria. Yet there’s that 12″ gap in the unit completely against all previous concepts and rules of unit coherency. That gap could be arbitrarily wide, and there are a lot of reasons you might want some configuration like this. Just off the cuff: You could take a unit of heavy weapons, divide them up into pairs, and spread them all across your deployment zone so that you have a mini-fireteam positioned on each shooting lane. This generally would not have been a particularly helpful before, but in 8th edition all the models can target different enemies so it could definitely be useful. More problematic, you could take a portion of a unit and put it in an essentially unreachable location so that it effectively can’t take wounds. Such near invulnerability could be very powerful if a model or models are providing an ability, stat, buff, or acting as some kind of battery for the unit. They set up a bunch of Devastators spread across their deployment zone. You say they can’t do that. They ask you to show them the rule saying they can’t. You claim the designers intended for units to fight close together. They ask you to prove it. You say it’s always been that way. They point to any number of rules that were “always that way” and now aren’t. Maybe the designers do now intend for models of a unit to be able to fight off in pairs because at least as long as they have a buddy backing them up they’re able to operate semi-independently? It would be scarcely “crazier” as an intended change than independent characters not being able to join units. So, now what to do? For better or for worse this updated rule potentially changes the game quite a bit, reducing one of its differences from skirmish games. A configuration like this is completely against previous ideas of coherency so most players with even minimal experience are going to think it’s wrong. Having units all over the board will definitely slow games down. Worst of all, it will be extremely frustrating if someone tries to exploit what is probably an inadvertently granted ability to hide away a battery or ability-granting model while other elements of its unit operate elsewhere. Here’s another problem circling 8th edition coherency that doesn’t require anything but a very possible outcome in very traditional and straightforward play: What if a unit takes casualties such that it is no longer in coherency and cannot get back into coherency in a single move? This is not uncommon, for example, with any decent sized unit that loses models in the middle of a stretched out line, and there is no rule forbidding or preventing a player from allocating wounds in such a way. Previous editions had a simple paragraph of text explaining that the unit had to try to move back toward coherency as best as possible at each opportunity to do so. Rules-as-written in the 8th edition text though, that unit is immobilized. 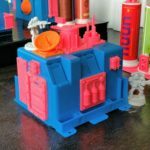 If a unit “must be set up and finish any sort of move as a group with every model within 2″ horizontally and 6″ vertically of at least one other model from their unit” then it cannot make a move that ends with it out of coherency, plain and simple. There is no other provision to move given, so a unit that has its coherency broken and cannot restore it in a single move is thereafter stuck. Units getting immobilized like this doesn’t seem like anything that would be reasonably intended. It’s very non-intuitive, frustrating gameplay, not explicitly described, a major change, and not a previewed one. Presumably most people will play as before and move toward coherency as best as possible. But then: Do you have to advance, or is it enough to just move? Previous editions explicitly noted that you had to run as well if you were out of coherency and could not restore it in a move, but there is no such note about advancing in 8th and it would not be absurd for someone to not assume such. To that point about assumptions, what if you’ve never played before? How do you know what to do when coherency breaks? Being stuck clearly isn’t going to seem right but the straight rules text doesn’t let you move or provide other guidance, so now you’re putting your game on pause to deliberate on what should happen, potentially consult forums, and so on. A chunk of the time savings gained in speeding up the game just got burned up, and that’s for a very simple question with immediately likely answers. In sum: Many people will simply say “Don’t be that guy, just play the obvious way and don’t exploit the rules.” But why shouldn’t I play to win within the given rules? And what if you’ve never played before? Who decides what’s obvious and fair? That obviously should be and largely can only be Games Workshop, but as they have so many times in the past, they’ve abdicated that role on these example questions. Many people think of ambiguous and unclear rules as problems mostly for tournament players. But that’s entirely wrong. Despite the various communities with their own FAQs and such, tournament players are the most prepared to mitigate and obviate these kinds of issues. Playing with strangers and in a competitive settling quickly exposes rules misunderstandings and uncertainties, forcing their resolution. Tournaments also have the people, structure, and impetus to develop and disseminate FAQs as needed. Casual players don’t have any of that. They’re on their own, encountering problems ad hoc and coming up with ad hoc solutions, and then potentially hitting entirely different solutions when they do go play other people, even casually. What happens to people at home playing 40k the first time unit coherency is broken and they have to figure out what to do next? Their game just stalled as they work it out. Worse, what about some young newcomer who builds a whole army strategy around breaking up their heavy weapons into mini-fireteams and then shows up at weeknight open gaming only to be told that’s not how the game works even though the rules don’t actually forbid it and they have no a priori way to know that? That’s going to be devastating. In order to play games quickly and with strangers possessing their own set of assumptions and experiences, you need clear rules, regardless of how competitive or casual the match. Ambiguity is detrimental to the experience of all types of players. I’m all for streamlining games. Being able to play games quickly is one huge positive. Clear and concise rules with an underlying elegance often also yield more strategic depth. But note in this area at least that nothing has been streamlined, the rules are just marginally shorter in text. The original coherency rules were two short, clear paragraphs that adequately captured a simple mechanic even as they could have perhaps been made even shorter and more clear. Instead, now there’s almost as much text as before, the game is no simpler, and a number of additional questions are generated even with only cursory investigation. Frustratingly, this isn’t even a space saving issue—there’s plenty of whitespace on that page immediately below the rule that could have been used to define coherency just as well as before or better. Maybe I’m way off base and despite all indications the new coherency rules are indeed intended to permit splitting up units into pairs. But how to act when coherency is broken seems like an outright omission. It’s a straightforward one so probably it won’t be too much of a problem. But these are non-trivial, completely unnecessary problems that did not exist before and come up within the first minute of reading the new rules, literally in the third paragraph. How many other similar issues are there going to be in these “streamlined” rules? How many of them are exploitable to distort the game? Even setting aside Games Workshop’s track record on these kinds of issues, encountering such questions so quickly at minimum warrants some skepticism about what else will come up in the rest of the rules once read in depth and on the table. One of the risks in simplifying a game design, especially in revamping a large, complicated ruleset, is over-streamlining. Miniatures games are complicated. It’s often very difficult to spell out intended mechanics and behaviors in a short, simple way. There are many edge cases that need to be covered, and people come at rules with a broad spectrum of assumptions. Simply cutting text is not the same as clarifying and speeding up the game. Just a few more sentences here—carried over from previous editions, no less—would have averted non-trivial potential for confusion and abuse. Despite the observations in this post I’m optimistic about this edition and excited about the enthusiasm around it. I think it quite likely to turn out really fun to play and a huge boon to 40k. But we should not be over optimistic that it is magically free of open issues or not already, even before release, in need of FAQs and erratas. There are multiple reasonable indications to the contrary and it would be completely appropriate to assume so of any essentially new ruleset for any game. 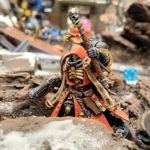 Rebooted 40k also may not be intrinsically more suited than it has been in the past to either competitive or pick-up battles, as opposed to play in small, repeat groups that develop a shared consensus understanding of the rules. The good news though is people have made all those viable in past editions. So, yes, we’ll probably still need to hammer out FAQs and complain about balance and construct missions to address various issues and so on. Eighth edition could and should be great, but just as with past versions I also think it’s going to take work. The real question then becomes: Is this a better basis from which to do that work? I think so, and I certainly hope so. We’ll start finding out tomorrow! This post discusses a few concrete examples of duplication and ambiguity problems cropping up as the codexes and supplements come out. This entry was posted in design, miniatures and tagged 40k, featured design, miniatures, rules. Bookmark the permalink.